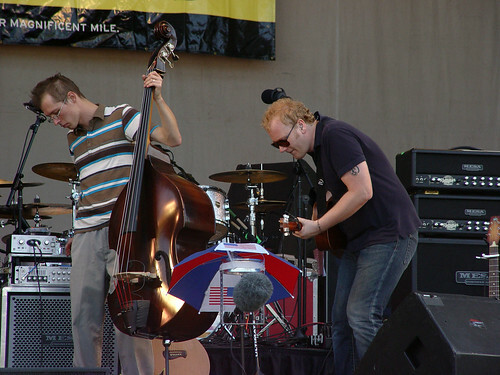 The Mike Doughty Band played at the Taste of Chicago on July 4th, which to us means, "yay! Andrew is coming to town!" I mean, and also, "yay! Mike Doughty is coming to town!" Oh, you know, it's different, but both good. We're fans of Mike, but friends of Andrew. Anyway, too much explaining. It was a beautiful day at the Taste -- sunny, but not too hot. The band played a nice, tight set -- without hardly any of Mike's entertaining banter. But I can understand why -- the band was the opening act of three and it's always better to give the fans more music than banter (more rock, if you will, less talk). We blew off right after their set to talk to Andrew (Livingston), which meant we missed Andrew (Bird) playing with My Morning Jacket. Oops. It was great to see Andrew (and nice to see Mike and Pete and Chuck, too) (and meet Kirby). Anyway, I took a bunch of pictures. Oh, and here's a great picture of Andrew on Mike's blog.